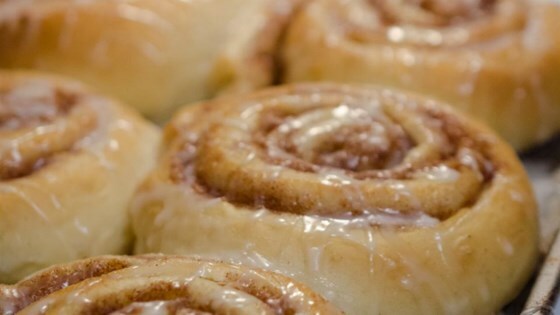 "Americans would call these cinnamon rolls--but this version is the original Danish version and it's absolutely wonderful. They are traditionally served with coffee or tea at Christmas time, and they are to die for!" Pour the warm milk into a mixing bowl and mash in the fresh cake yeast. Mix in 6 1/2 tablespoons of soft butter, eggs, cardamom, 2 tablespoons sugar, salt, and 3 1/2 cups of the flour. Use a wooden spoon to mix the dough. If it's very sticky, mix in the remaining 1/2 cup of flour. Cover the bowl and let the dough rise for 30 minutes. Cream together the 2/3 cup butter and 1/2 cup sugar. Stir in the cinnamon. Preheat an oven to 425 degrees F (220 degrees C). Line a baking sheet with parchment paper, or grease a baking dish or two cake pans. Place the rolls on the prepared baking sheet, spacing them about 3 inches apart. If you like pull-apart rolls, arrange them in a greased baking dish or cake pans, spacing the rolls about 1 inch apart. Place the uneven end pieces on the baking sheet cut-side up for the best presentation. Let the rolls rest 20 minutes before baking. Bake the snails in the preheated oven until golden brown, about 10 minutes. Pull-apart rolls will take longer to bake: after 10 minutes, reduce the oven temperature to 350 degrees F (175 degrees C) and bake the rolls until the sides are fully set, about 10 minutes longer. Cover the baking dish with foil if the rolls begin to get too brown. verry good!!! double the filling, wasnt enough for me.. also, when u decrease the temp to 350, only bake for 8 more min..PERFECTION! !